Kawasaki Disease (mucocutaneous lymph node syndrome) is an acute systemic vasculitis of unknown origin that occurs usually in children less than 5 years of age. The disease is self-limiting, however, about 20% of those untreated will likely develop a cardiac complication such as coronary arteritis and aneurysm formation. The disease is divided into 3 phases: the acute phase is described by progressive small blood vessels inflammation (vasculitis) accompanied by high fever, inflammation of the pharynx, dry, reddened eyes, swollen hands and feet, rash, and cervical lymphadenopathy. In the subacute phase, the manifestations disappear, but there is inflammation of larger vessels and the child is at highest risk of developing coronary aneurysms. In the convalescent phase (6-8 weeks after onset), signs and symptoms slowly go away, but laboratory values are not completely normal. There are no specific tests to confirm Kawasaki disease, but normally the diagnosis is established on the basis of the child exhibiting at least 5 of 6 criterion manifestations. Treatment started within 10 days of symptoms often prevents the development of complications. 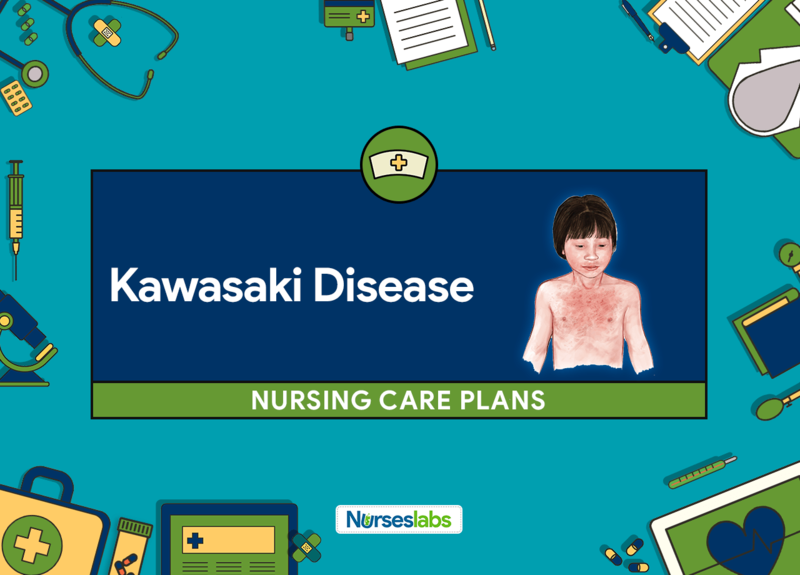 Nursing goals for a child with Kawasaki disease may include increased understanding of the parents and child about the disease condition, medical treatment and planned follow-up care, relief of pain, improved physical mobility, adequate coping, and absence of complications. Child will maintain a normal temperature. Monitor temperature every 4 hours; every 2 hours if elevated. Kawasaki disease initially begins with a high fever (102° to 104°F) for 5 or more days in duration. Provide sponge baths for temperature over 101°F. Tepid sponge bath promotes heat loss through conduction and evaporation. Provide adequate rest periods. Bed rest decreases metabolic demands and oxygen consumption. Use a cooling blanket for higher temperatures that do not respond to antipyretics. Extra wrapping of extremities prevents shivering; shivering promotes further heat. Encourage adequate fluid intake as indicated. If the child is dehydrated or diaphoretic, fluid loss contributes to fever. It is an anti-inflammatory drug that is given to reduce inflammation. It is given in single dose to treat and reduce inflammation and thereby lessen the duration of fever.